• Excellent hedging and good wind tolerance. • Generally happy in full sun or partial shade. • Widely available in a range of colours. • Hardy in all Taranaki conditions. • Not affected by camellia petal blight. 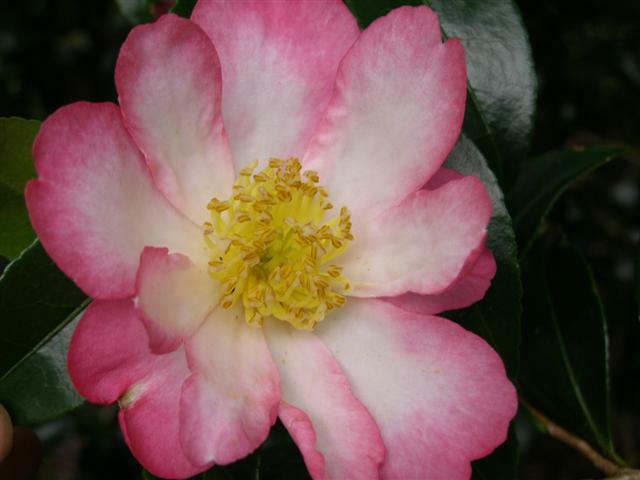 The first camellias of the season to flower each year are the sasanqua group from Japan. The white sasanqua hedge, Setsugekka in particular, has become a garden cliché in New Zealand but that should not detract from the garden value of this useful and hardy group of evergreen shrubs. When the deciduous trees are changing colour and dropping their foliage, the mass flowering of sasanquas is a cheerful sight. With smaller leaves in a good deep green and a growth habit that is a little lighter and airier than the rather solid japonica camellias which flower later in winter, sasanquas are less chunky as garden plants. As well as the whites (Early Pearly, Silver Dollar, Mine No Yuki and the like), there is a whole range of pinks from pale to deep shades, a few reds and some attractive bi-colours such as the deep pink and white Gay Border. The flowers are softer and less formal than the japonicas. If you want to clip your sasanqua camellia, the rule of thumb is to do it as flowering ends with a follow-up on wayward growths in spring. It will then hold its tidy form for the rest of the year. This entry was posted in Plant collector and tagged autumn flowering shrubs, Camellia Gay Border, sasanqua camellias, tried and true plants on 21 May 2010 by Abbie Jury. Would I be able to use this image above for a gardening calendar I am designing? I am happy to provide credit for the photographer’s name. The photo would appear small in this calendar. Thank you for having the courtesy to ask. I will reply to your email address. I would like to standardise a camelia,does it have to be a sasanqua, or can I just have any camelia I want as long as it has a straight trunk?? No, it doesn’t have to be a sasanqua at all but you will find it easier if you pick a slower growing variety which doesn’t make very long whippy growths because you are trying to slow its natural growth and to make it denser and more compact.